Some re-painting sadly on the black wings, but it is genuine. Not doing too bad now, just need all cream / red hubs, Dark Green with light green hubs, Yellow and Light Blue with windows, and yellow with Dark Blue. 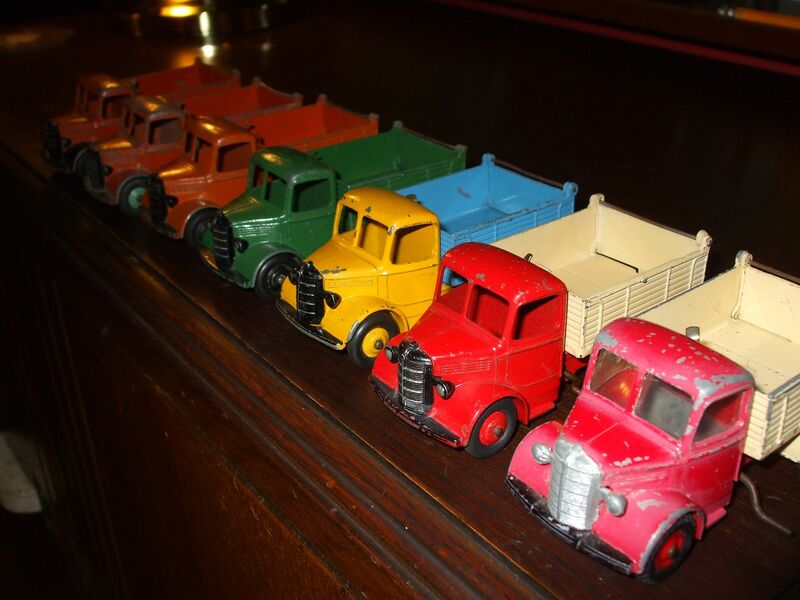 Chris--Nice collection of Bedford's there...........a large variety of colors for sure!! I did not know that some were issued with black wings.....was that a very early one?? Look better this way I think. Cheaper and easier to make without the masking for the painting I presume though. Glad to get all cream off the list, and yellow / blue has windows. I've been looking at these in a bit more detail, in particular the Red / Cream version and it's variations. I have : No windows / Metal hubs / Black Grille. Windows / Metal hubs / Black Grille. Windows / Plastic Hubs / Silver Grille. So, logically I figure that silver grille and Plastic hubs were not introduced at the same time, so EITHER :Windows / Metal Hubs / Silver Grille. OR :Windows / Plastic Hubs / Black Grille must then exist. Logical so far? Wrong. They BOTH exist looking at old Vectis results. I can't even imagine how that falls into any logical timeframe, unless production was truly random using what parts were to hand at the time. 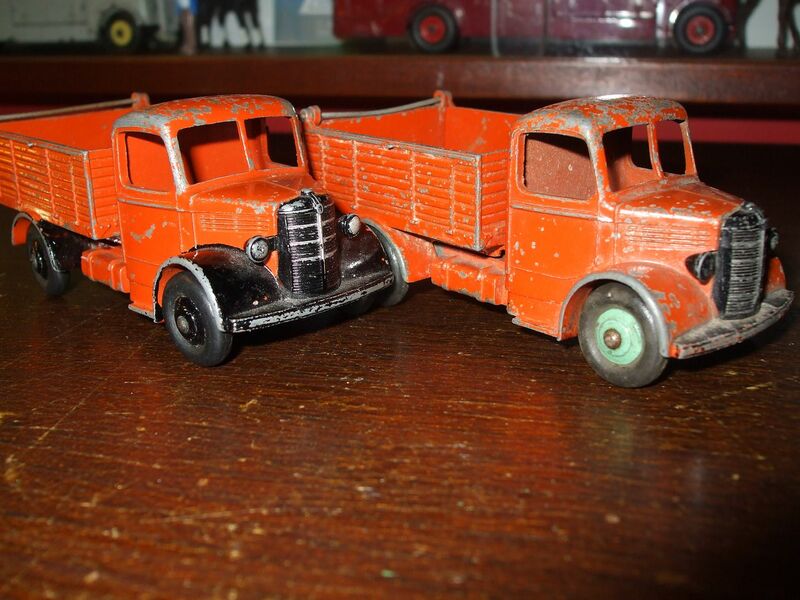 Sometimes Dinky collecting drives you up the wall doesn't it? But I suppose that's why I love it. Well done in getting the all cream version - it looks good in this colour. 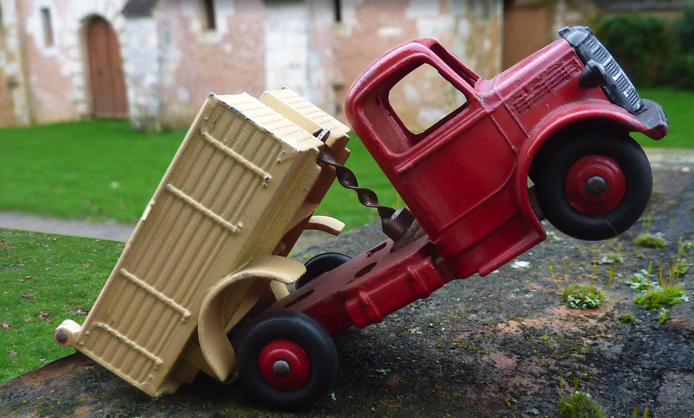 You certainly shouldn't expect Dinky to have followed logic - where would the fun be in that? 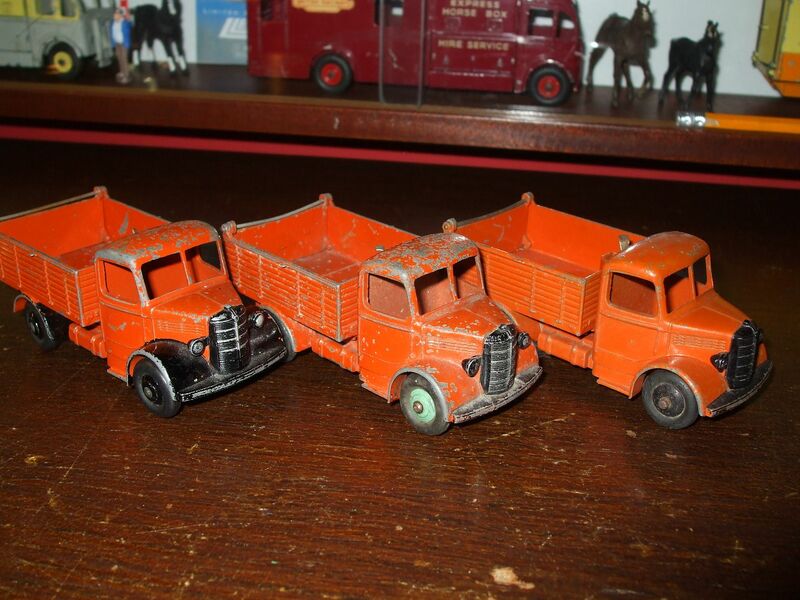 My favourite of these Bedfords is the refuse wagon - there must be lots of variations on that one! My only lonely example, the red/cream one, showing the tipping action. 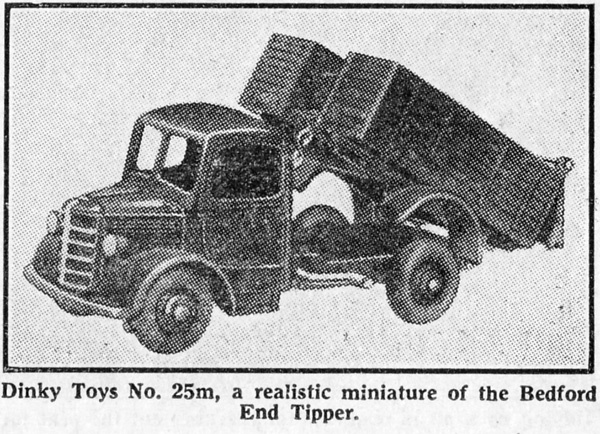 Meccano Magazine of March 1948 paid special attention to the newly introduced model, proudly explaining and showing the tipping action. 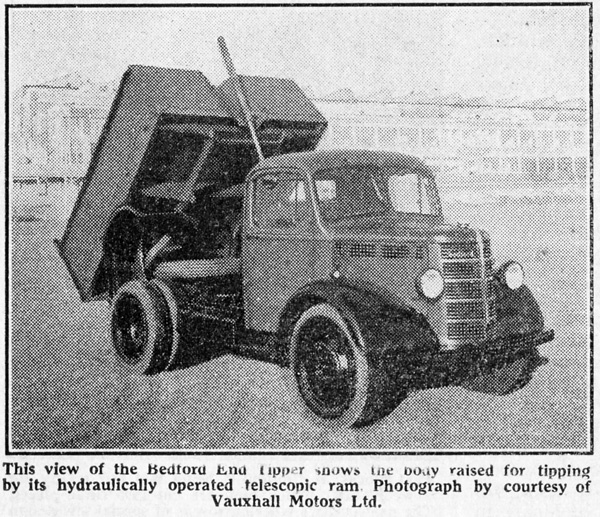 The Tipper in some more detail. The real one shown on this page, also a bit larger now. 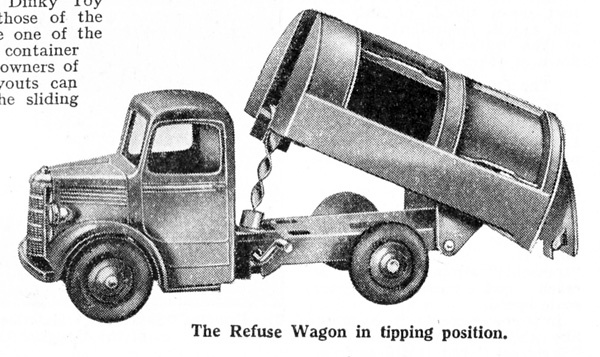 Of course the Refuse Wagon was equipped with the same spiralling mechanism, in order to dispose of the waste. 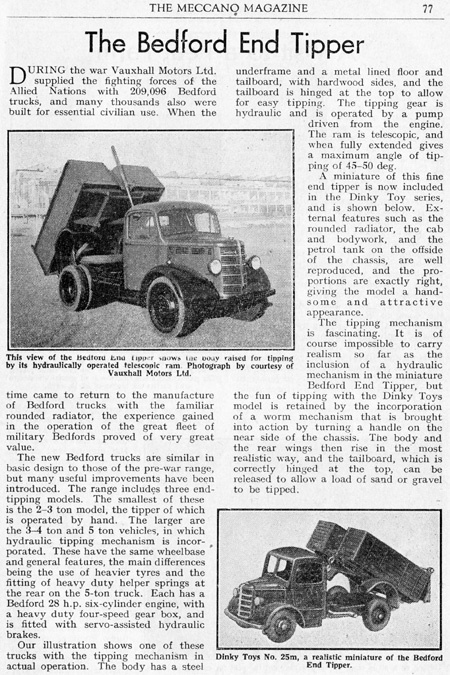 In Meccano Magazine of October 1948 is was this model's turn to have some more attention. Wonderful models and articles. Thank you. Looking at the real one isn't it a shame that Meccano didn't fit double wheels to the back? 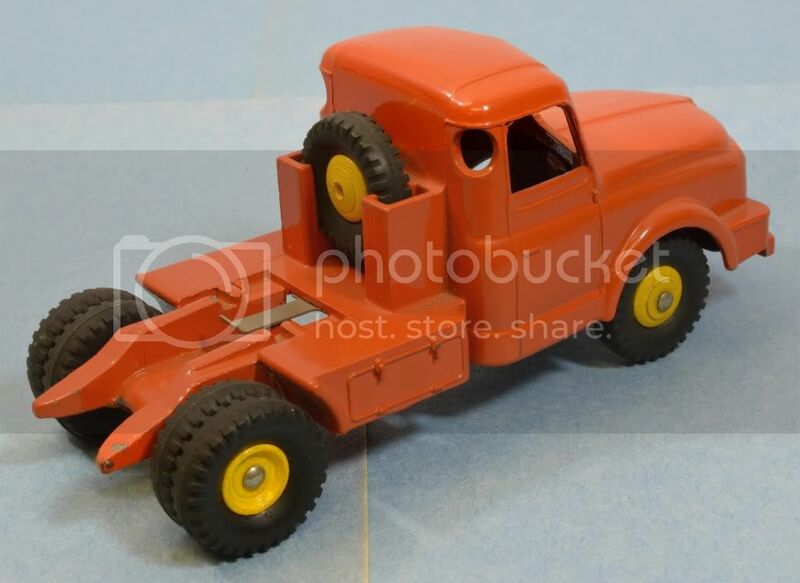 Chris--I totally agree with you about how much nicer it would have been to have dual tires and wheels on many of the Dinky trucks. 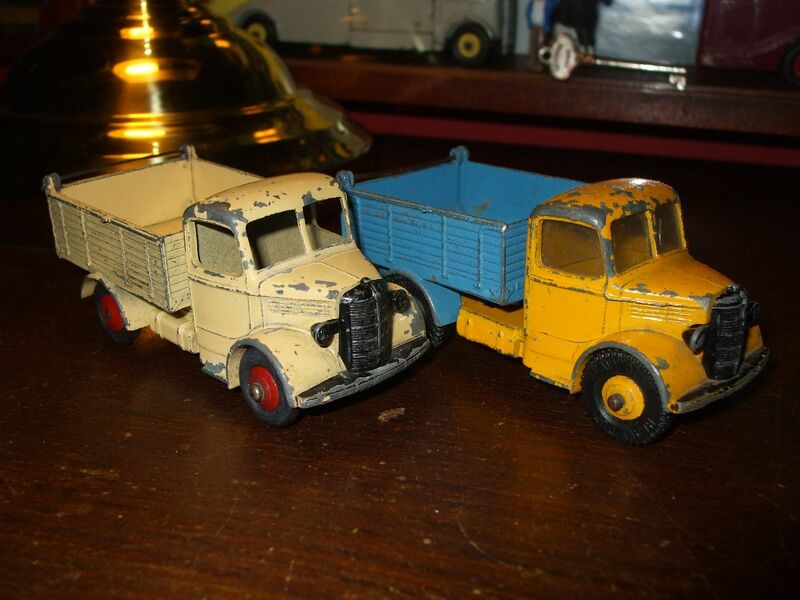 Jan Werner and I both discussed that last year, and some of the French Dinky's started incorporating that feature. 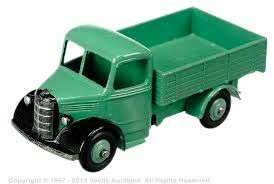 Below is a picture of my Willeme tractor, part of the French Dinky Log Truck, showing its dual rear wheels and tires....sorry, not trying to change the subject but just showing for example. 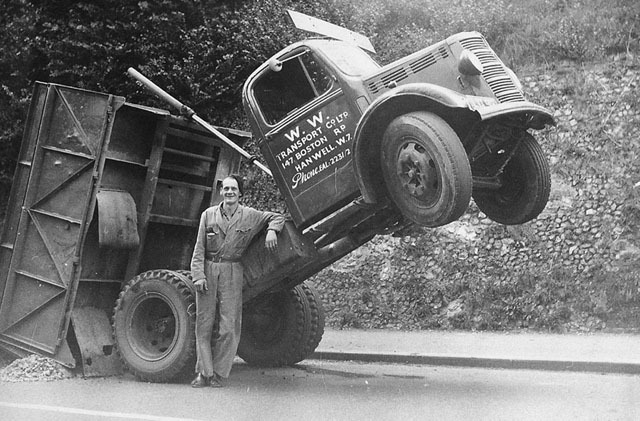 Well, this is an un-usual way to use a tipper, the guy looks proud of himself. Dinky can do it too.